them, and the light is correspondingly feeble. 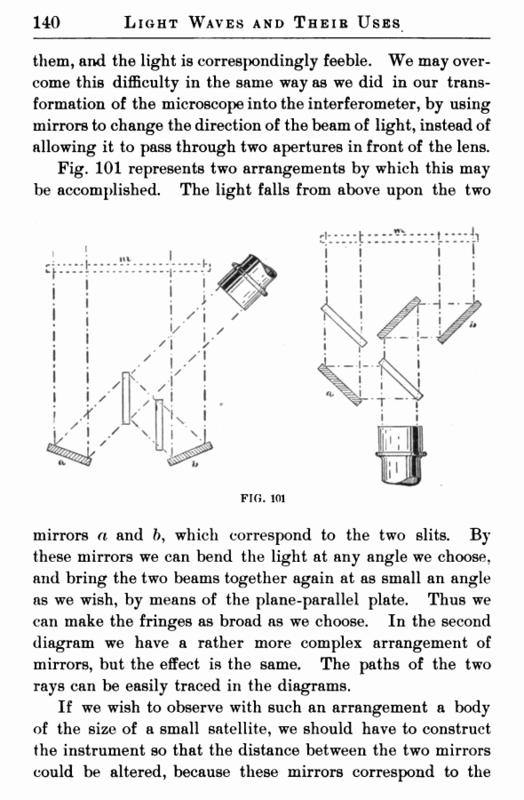 We may overcome this difficulty in the same way as we did in our transformation of the microscope into the interferometer, by using mirrors to change the direction of the beam of light, instead of allowing it to pass through two apertures in front of the lens. mirrors a and b, which correspond to the two slits. By these mirrors we can bend the light at any angle we choose, and bring the two beams together again at as small an angle as we wish, by means of the plane-parallel plate. Thus we can make the fringes as broad as we choose. In the second diagram we have a rather more complex arrangement of mirrors, but the effect is the same. The paths of the two rays can be easily traced in the diagrams. two slits whose distance apart must be changed. This can be done by mounting the mirror a and the mirror b on a right- and left-handed screw. On turning the screw the two mirrors would move in opposite directions through equal distances, leaving everything ‘else unchanged. Such an instrument is represented in Fig. 102. 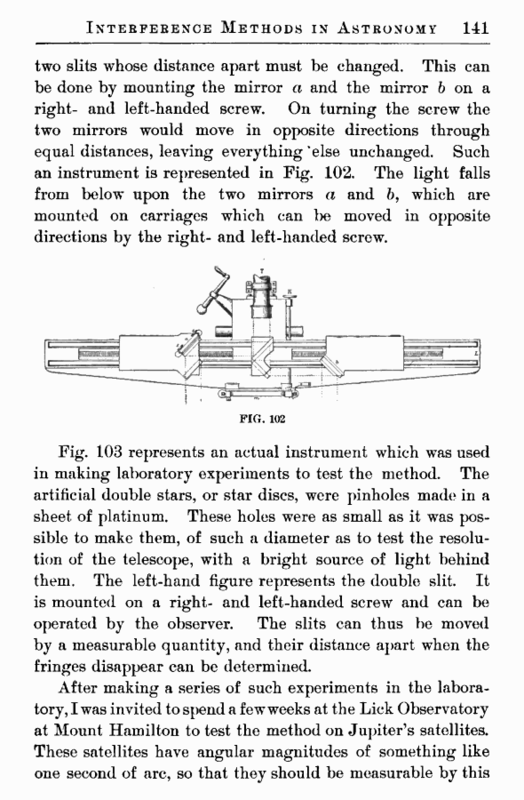 The light falls from below upon the two mirrors a and b, which are mounted on carriages which can l)e moved in opposite directions by the right- and left-handed screw. Fig. 103 represents an actual instrument which was used in making laboratory experiments to test the method. The artificial double stars, or star discs, were pinholes made in a sheet of platinum. These holes were as small as it was possible to make them, of such a diameter as to test the resolution of the telescope, with a bright source of light behind them. The left-hand figure represents the double slit. It is mounted on a right- and left-handed screw and can be operated by the observer. The slits can thus be moved by a measurable quantity, and their distance apart when the fringes disappear can be determined.